For about fifteen years now the food of the convict and Colonial era has fascinated me. I spend every available moment familiarising myself with the dishes, the style of cookery and the cooking equipment by way of stoves and utensils that were available back in those times. The history of the food is interwoven through and intrinsic to the culture of the era. Back then people lived by necessity from the land, working with seasonality, preserving what they could for leaner months. Last weekend at Port Arthur Historic Site was a culmination of all this research when daughter Stephanie and I were asked to prepare a Colonial dinner for a group of guests at Port Arthur Historic Site. An especial privilege was to use the slow combustion wood stove that dates back to the colonial era. It is located in the separate kitchen behind the Junior Medical Officers House. Kitchens were very often situated like this, in an outbuilidng to prevent the permeation of cooking odours through the main house, as well as reducing the risk of fire. 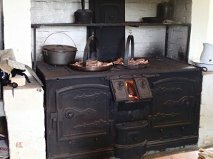 The stove was amazing once it was fuelled to capacity and was used to cook the lamb with redcurrant and thyme sauce, wallaby shanks and many vegetable side dishes, as well as soups, cakes and breads for the occasion. 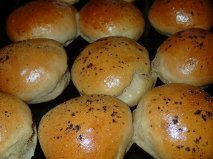 The bread rolls to accompany the soup were made with spelt flour, the closest to the type of grain that would have been used back then. These were topped with Tasmanian Pepperberry dust to add a slight, interesting heat and earthy flavour. There was so much more to the menu – it was wonderful to be able to put into practice some of the dishes I’ve been researching and developing in this context. 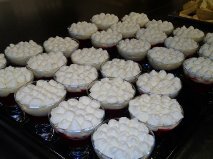 However, on a final note, here are photos of the desserts – individual trifles as guests had chosen, featuring berries that were such a passion for the colonials here. It has been said that the British invented puddings and certainly as soon as possible fruit and vegetable gardens and orchards were established, so that all sorts of seasonal fruits could be included in cooking and preserves. 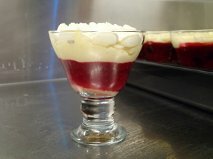 These trifles included blackberries, redcurrants and raspberries some of the favourite fruits of that time. 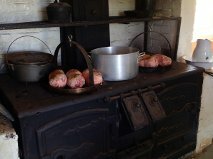 There is also a wonderful Colonial kitchen on display in the Commandant’s cottage at Port Arthur. If you visit the Historic Site, it is well worth going to see this. I was working in the JMO’s that day Sally and it all smelt sooooo divine! It was fantastic to see the kitchens back in use, hope you get to do it again and I get to be a guest! Sally Wise is a bestselling cookbook author, a regular guest on ABC radio and the brains behind the Sally Wise Cooking School in Tasmania's Derwent Valley.